The Blessing of Aokpe, Nigeria. 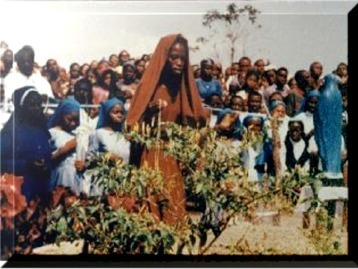 Christiana Agbo of Aokpe, a small village in Nigeria receives the great blessing of the Most Holy Presence of Our Lady speaking with her, in the same way that Our Lady blessed Saint Bernadette of Lourdes. The story is remarkable and very beautiful, of a young schoolgirl suddenly finding herself in Heaven while on earth, as with the young people in Kibeho, Rwanda a few years ago. The same Great Blessing is being given to six young people in Medjugorje where every day since 24th June 1981 they have been privileged to meet the Blessed Queen of Heaven. All across the earth Our Lady has chosen Her special people to deliver to us Her message of Prayer, Fasting and Repentance.
" I COME FROM HEAVEN. I AM THE REFUGE OF SINNERS. I COME FROM HEAVEN TO WIN SOULS FOR CHRIST AND TO HIDE MY CHILDREN IN MY IMMACULATE HEART. WHAT I WANT YOU TO DO IS TO PRAY FOR THE SOULS IN PURGATORY, TO PRAY FOR THE WORLD AND TO PRAY TO CONSOLE JESUS. WILL YOU ACCEPT?" THEN I ANSWERED HER "YES"
On a certain morning of the day in the month of October, 1992, I went to the farm to weed the portion of farm that was assigned to me by my mother. In the process of doing this at about 10am, I became very tired and I decided to stop working. When I stood up and lifted up my eyes, I saw some flashes of light that were flashing towards me, Then I asked my sisters if they saw the flashes of light. They said they did not see them and possibly it was the rays from the sun but I saw something different. I was sent by my mother to a nearby farm to collect some herbs for her. As I was collecting the herbs I lifted up my eyes and to my surprise, I saw a very beautiful woman standing in the air. As I was looking at her, she was smiling at me. She stood there without saying anything to me. She was just looking at me smiling. I became afraid and climbed down and knelt and just I knelt down she disappeared. In the same month at about 3pm, I was in my room and suddenly I saw two angels singing. I became afraid and ran out. My brother went and called my mother to come and my mother came. She said that she could not see anything. The two angels were there for some hours and one of the angels said to me, I am the Angel of Peace. After saying these words, the two angels then disappeared. When Christiana saw Our Lady, she fell down and her cousin started shouting Mama "Christy is dead". Everybody came running and shouting "Christy, is dead". When they touched her, her body was strong like a stone. Christiana was unconscious for three hours. When she woke up, she was smiling and saying ‘Mama’ that woman that I saw was so beautiful’ My father said it is because of that woman that you fell down and we have been worrying. "Behold I am The Holy Mother, come! Do not be afraid. I will come another time to introduce myself to you and tell you what I want from you." " After praying the rosary sit down and meditate for sometime". After she had said these words, she disappeared. At about 6pm when I looked up in the sky, I saw stars that formed a circle around the moon. I counted the stars and they were 12 in number. "Pray fervently for the world. The world is rotten with sin. ......."
Then I saw an opening on the wall of the room where I was staying, opposite the door, and a hand appeared and carried the cup with the host on the surface and locked it inside the opening. Then I heard a voice again. "This room is blessed and anybody who comes here to pray with faith will be saved". After saying this, she disappeared. "Behold, I am The Holy Mother and I will introduce myself another time." "I will appear to purify my children"
" THE TIME OF GIVING MY NAME HAS NOT YET COME. THE NAME I WILL BRING WILL BE A POWERFUL NAME, I WILL DO MANY THINGS IN ST. PATRICK’S CHURCH...."
At Aokpe there have been physical cures reported . At every monthly pilgrimage the people come forward to testify to favours received. The two best known cures are the receiving back of their sight of two blind men, in the two largest pilgrimages, those of January and February 1996. It is reported that the joy of the blind man in the January cure was really something special. There was also the miracle when Christiana received Holy Communion on the tongue from an angel. However the great and distinctive miracle at Aokpe is that of the sun. Our Lady made this clear from the beginning. She has given us this miracle on a scale possibly greater than as ever happened before so that we will believe. "My daughter, Yes, be sure the sun will go dark, only the Faithful will be given light and My dear Mother was so kind to tell you the hours it is going to last, seventy two." Then Jesus went on to explain to Christiana at length the reason why Our Lady appeared as the Rosa Mystica and the Mother of God. This was only for her benefit. One problem was solved during this apparition. When Christiana told me earlier in the year that Our Lady wanted the Mediatrix of all Graces statue at the Grotto I showed her the place in one of the message books where it states that what Our Lady wants for the Grotto is the big Rosa Mystica statue. Christiana said that at the last Public Apparition Our Lady had asked for the Mediatrix of all Graces statue described what it should look like and that someone was working on it. This was one of the things she was waiting to find out if possible from Our Lady. In the event it was Jesus Himself who supplied the answer. 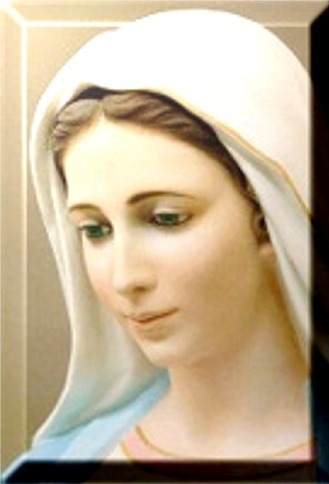 Our Lady wants the Mediatrix of all Graces statue at the Grotto and the Rosa Mystica statue should be nearby. Walk with me in the light of faith so that I will show you the way. Pray also for wisdom and the fear of God and "walk with me in the light of faith Hold your weapon (Rosary) very well and tight and pray powerfully and faithfully. Satan is really at work and during the time of the three days of darkness the demons will work harder because that will be their time. Satan cannot defeat my children because of the Rosary." "Little children, I have come today to warn you again, to repent of your sins and if you do not repent, God will be angry with you. There will be trouble in the world. God will destroy the world and it will be really great. The Anger of God will come down on earth. During the Three Days of Darkness the thunder and lightning will shake the world.
" You should take the crucifix and pray. Nothing will give light except the Blessed Candles. When Christiana asked Our Lady what are we to do to stop the three days darkness Our Lady replied that we should pray and stop sinning. "My little child, every day people commit sin and new evils spring up. The time is very, very short. Return now"
"I went inside and none of my prayer mates were with me. I was alone in the room. The three days darkness started and I started to pray and light came and hung over me and there was a very terrifying sound outside. People were trying to hide themselves under things. There were fierce winds, thunder and an earthquake. What the devil was doing to people outside was terrible. "I want you to go to school because there will be a lot of work for you after the three days darkness. All of you should go to school. Respect your teachers. Love each other and do things together"
Another message of Our Lady at Aokpe about silence was given the day that Christiana received Holy Communion on the tongue from an angel. Our Lady said wherever there is the Blessed Sacrament there must be absolute silence. These days in so many Churches talking, and laughing has become the usual thing at the end of Sunday Masses making it very difficult for anyone to make their thanksgiving prayer. It is useful to know what Our Lady thinks about this behaviour.